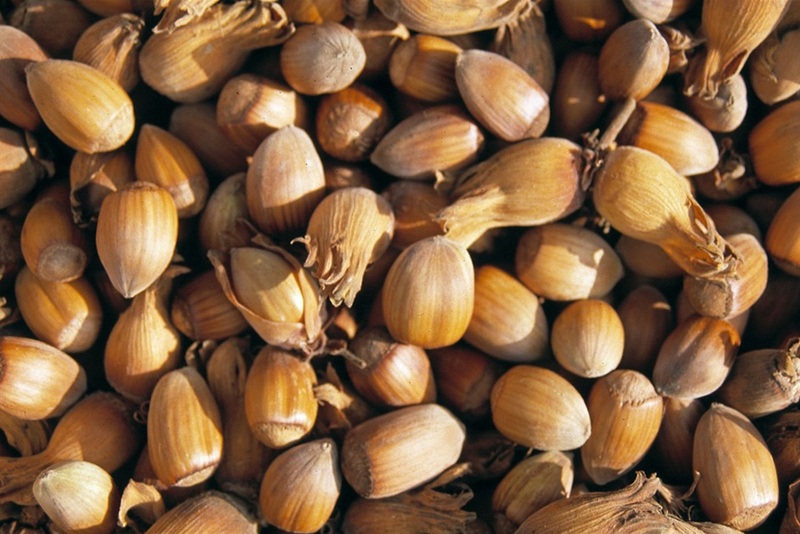 Roasting enhances the flavour of cobnuts. Only a few ounces, coarsely ground, lend a nutty tang to dishes savoury or sweet. 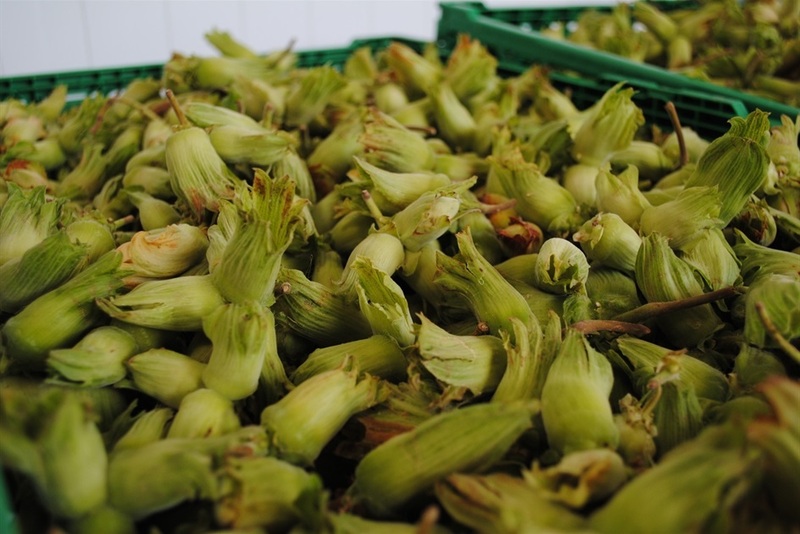 To roast cobnuts, shell them and place them in an oven at 150°C/Gas Mark 2 for up to an hour, depending on their size and freshness, until they are hard and browned. About 100g (4 oz) nuts in their shells will produce 40g (1½ oz) of roasted kernels, but be generous:- they are so delicious some may never reach the dish. A delicious hors d'oeuvre or snack which is very easy to make. Put the nuts and butter, together with a little salt, into a shallow, uncovered dish. Microwave on high for 3 minutes, stir, cook for another 3 minutes, and stir again. If the nuts are not yet crisp, cook for another 3 minutes, checking that they do not burn. Roast the cobnuts (see above). Chop a quarter of them coarsely and grind the rest in a coffee mill. Sieve flour and add the ground nuts and sugar. Rub in the butter until the mixture resembles fine bread-crumbs. Knead lightly and chill the dough in the fridge for half an hour. Divide the dough into four and roll each.piece out on baking parchment into a circle 1/3cm thick. Lift on the baking parchment onto baking trays and bake for 15 minutes, until golden brown. Cool on wire trays. Put 75g (3 oz.) caster sugar and 3 dessertspoonfuls of water into a small pan over a low heat. Stir until dissolved. Turn up the heat and boil briskly without striiring until it is caralmel-coloured. Beware - don't boil for too long. Pour enough of the caramel over one biscuit circle to cover it, spreading it evenly with an oiled palette knife. Sprinkle the coarsly-chopped nuts round the edge of the caramel and arrange a quarter of the raspberries in the centre. Trickle over the remaining caramel. Whip the cream and spread over the other three biscuit circles. Arrange fruit on top of the cream. Put the biscuits on top of each other, finishing with the caramel-topped biscuit. Sauté the onions in a little oil. Add the pork and sauté . Add the flour and then gradually mix in the cider and lemon juice, rosemary and coriander seeds. Cook slowly for 20 minutes, keeping the casserole simmering, then add the mushrooms and quartered apples and simmer for about 10 minutes, until the pork is tender. Season. Add the cobnuts just before heating through to serve. Core the apples and slice into wedges. skin the avocado and slice. Put the apple and avocado into a bowl and cover with lemon juice. Just before serving, drain, chop the watercress and nuts, and add to the salad. Toss with good French dressing and season to taste. Stone and halve the plums, and shell the cobnuts and chop them coarsely. Fry the onions in half the butter. Mix all the filling ingredients together and season to taste. Pack into the marrow and dot with the rest of the butter. Cover and cook in a moderate oven (170°C, gas mark 3) for 1½ to 2 hours, depending on the size of the marrow.